Adoptive mom Claudette Lowery, who has helped raise 23 children, says the greatest reward is hearing her children say, ‘because you loved and believed in me, I made it’. Claudette is currently parenting a sibling group of 6 sisters! She has also unofficially adopted a nephew and been called “mom” by many. She says the best part of adoption for her was witnessing her birth children grow to see the beauty of providing love and permanency to children in need. 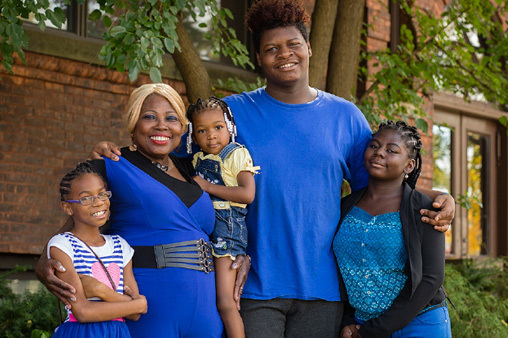 It wasn’t until her 3 birth children witnessed Claudette filling the role of grandmother to the children of her “adopted” children that they truly understood the value of adoption. Claudette says, "They realized they weren't losing me and it was a good thing. It was a wonderful feeling for me." It was confirmed that her birth children embraced the idea of adoption when one of the six sisters was born and needed to be placed with her on an emergency basis- within 3 hours! Her birth daughters quickly came to her aid. They donated a crib and baby gear that their children no longer used. With her daughter’s help, Claudette had everything necessary to welcome the infant into her home within 3 hours. Adoption has also inspired her children who have been adopted to embrace a spirit of helpfulness and commitment to each other. Claudette says her children shield each other from hurt and pain and do not want to lose each other. “We are a tight knit group. They know they have each other. They like to be assured that I’m not going any place and neither are they,” explains Claudette.